Cut big eggplant in slices of 0.5сm, then cut in halves or qurters, salt, leave for 30-40 min, drain liquid and then fry till brown color, put in a sieve, to drain oil. 1 big hot green pepper, chop finely, 6-7 cloves of garlic (press it). 1,5 of lemon, squeeze juice. A small bunch of parsley and dill, chop finely. 0.5 tsp of black pepper, 0,5 tsp of sweet paprika, 0,25 tsp of spicy paprika, 0,3 tsp of curry, salt to taste, olive oil (not necessarily, but I added – it softens the spice). Mix pepper, garlic, greens, juice, spices, salt, then add eggplants, mix it, place in jar and put in the fridge for a few hours, better for a night. Salad is well with meat, fish, and just delicious with potatoes. 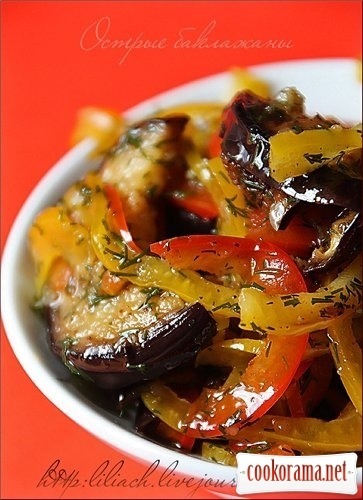 Top of recipe "Spicy eggplants"